For this episode of street sign language lessons, we draw examples from a recent trip we took north through Austria and southern Germany. Our first stop was Innsbruck where many of these photos were taken. 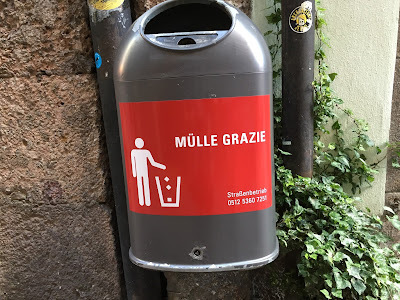 The official language in Austria is of course German, but you’ll find lots of signs that include Italian translations, especially in cities close to Italy. In fact, signs start featuring German and Italian well before you leave Italy. Two of the examples shown were taken near Bolzano. In this post you’ll learn about towing trailers on the A22, read about my love affair with stube, learn how to say sunny in Italian, see a statue that has been touched too much in its private parts, and discover how life is like a ski jump. What are you waiting for? Keep reading. 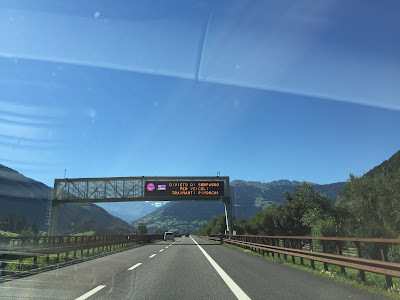 This sign was one of many we saw on the A22 Autostrada del Brennero as we headed north reminding drivers that vehicles towing a load cannot pass. (The rules governing passing are more complicated than shown here and depend on tonnage and location on the road.) The interesting words here are rimorchio / rimorchi meaning trailer or load and trainanti from trainare, to pull or tow. 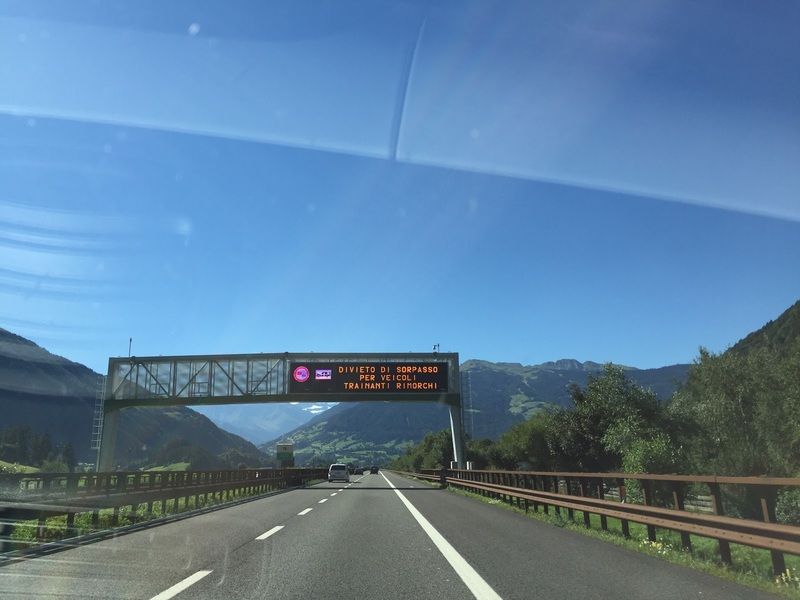 BTW: If you are driving north from Italy into Austria, don’t forget to purchase and affix an Austrian vignette to your windshield. You can buy them at many spots before you reach the border. If you don’t have one on an Austrian highway, you will get a ticket. Left: Stube in Albergo Signaterof. 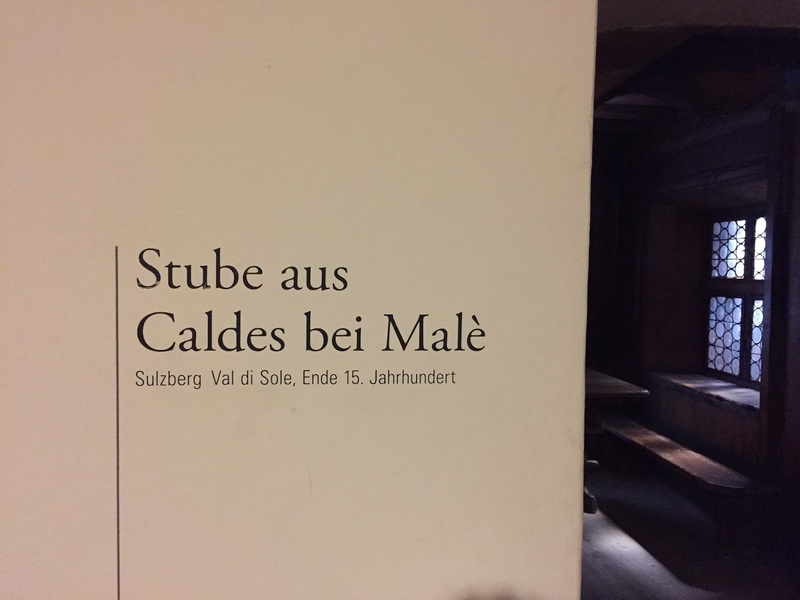 Center and right: Sign for Stube aus Caldes bei Malè example in Tiroler Volkskunstmuseum. Left: Sign indicating location of stube in Albergo Signaterof. Center: Canederli (knödel) with chanterelles (finferli) at Albergo Signaterof. 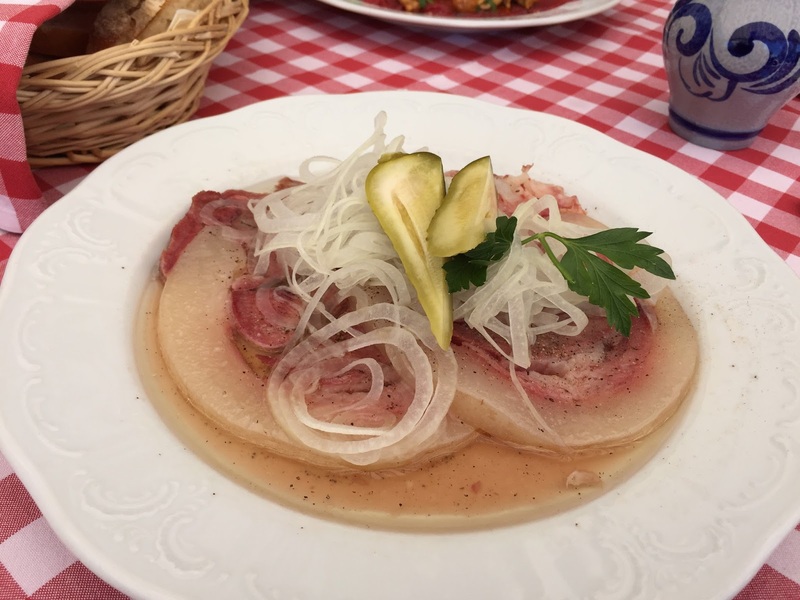 Right: Dish of testina at Albergo Signaterof. I am fascinated with stubes, a type of traditional living room found in the Tyrol area. 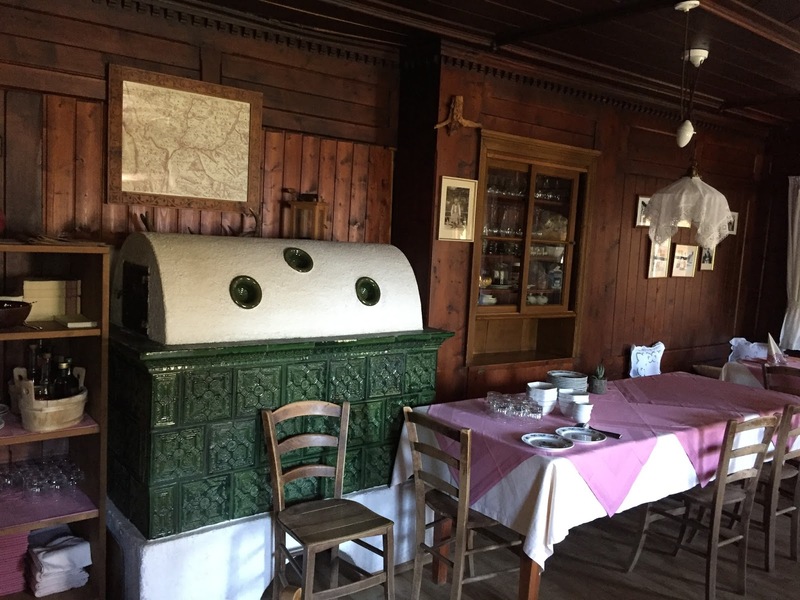 A stube is room lined with wood, with a low ceiling and usually containing a stove. We first experienced them in 2008 (see Ladin Mugums and Stuas) on our first trip in the Dolomites. To me, the rooms are like cozy studies where you can immerse yourself for hours reading or hiding from the world. 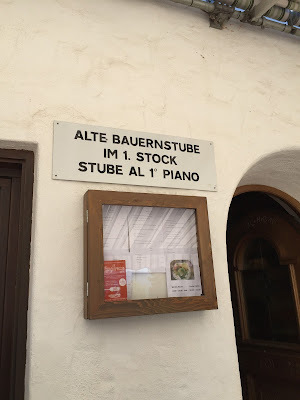 While we are dining at Albergo Signaterhof (above Bolzano) on our way north to Innsbruck, I see the sign and I remember the feel and smell of stubes. 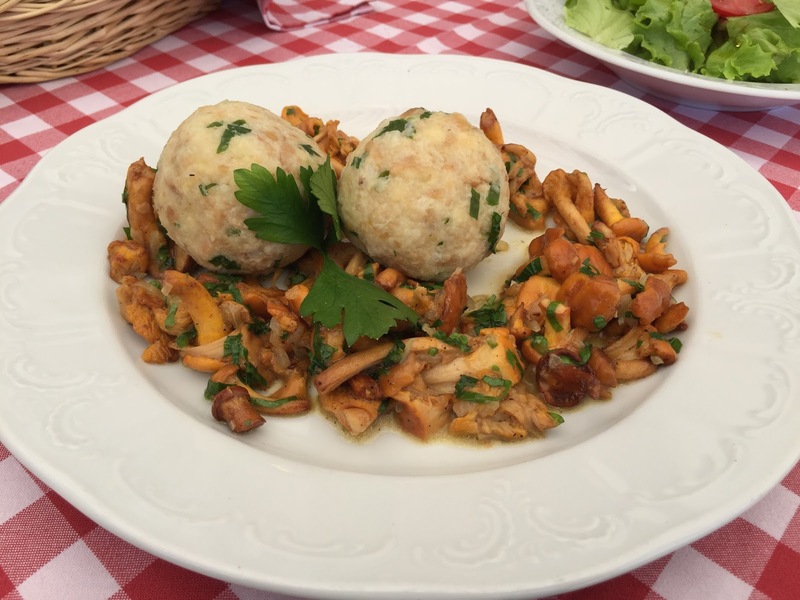 After a lunch of testina and canederli (knödel) with chanterelles (finferli), we check out the stube at Albergo Signaterhof. 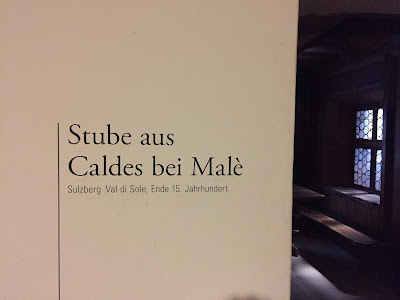 It’s satisfying, but even more satisfying is the fascinating collection of recreated stube we would see a few days later in the Tiroler Volkskunstmuseum in Innsbruck. Switching the language on your phone is a good exercise to learn new words. 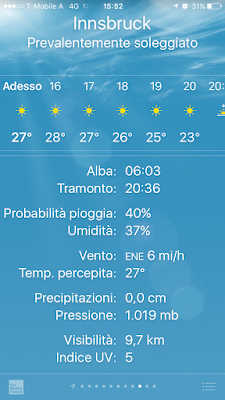 Here is a screen capture from the weather app on my phone showing the weather for Innsbruck. 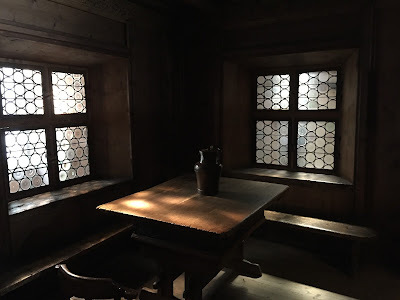 (Perfect weather for a hike that we did: Hike in Innsbruck: Hafelekarhaus to Pfeishütte.) 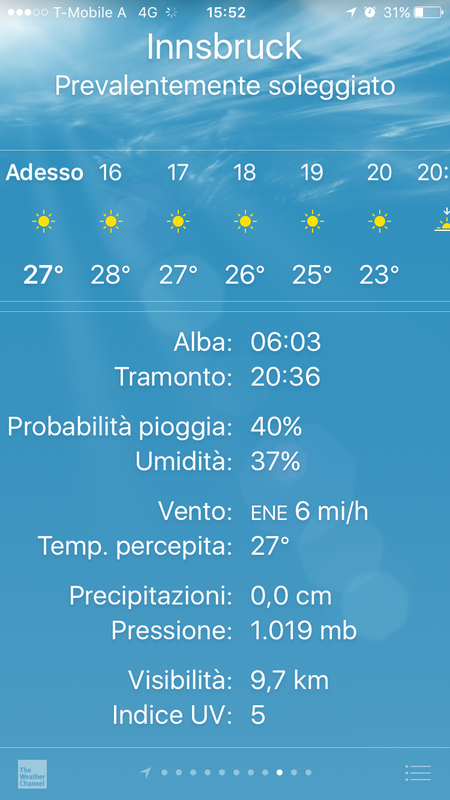 I was in the habit of saying c’è sole to indicate it was sunny out when the better way to say it is with the word soleggiato. Sign at Albergo Signaterhof asking customers to chip in some money if they are just using the bathroom. 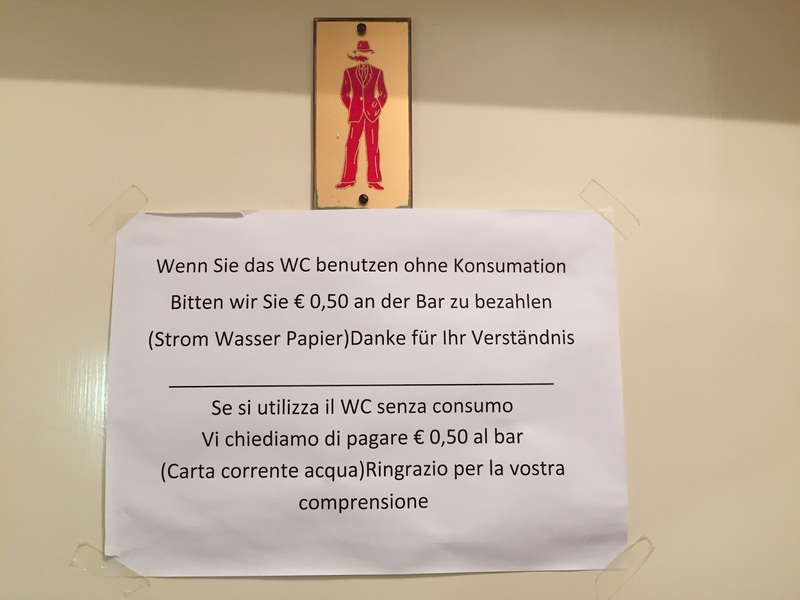 Se si utilizza il WC senza consumo vi chiediamo di pagare € 0,50 al bar (carta, corrente, acqua). Ringrazio per la vostra comprensione – If you use the bathroom without buying something we ask that you pay 50 cents at the bar (for paper, electricity, and water). Thanks for your understanding. We saw this sign at Albergo Signaterhof (above Bolzano) on our lunch stop during a trip north to Innsbruck. Resources are precious here and while it’s nice that you can use the bathroom (for example as a biker just passing through), you should contribute a little to keep it running if you aren’t buying something. 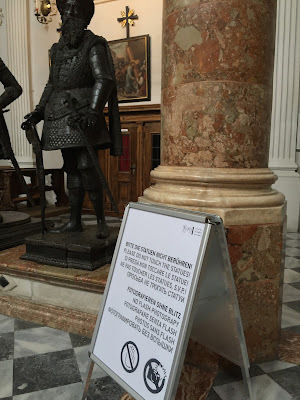 Sign and statues in Hofkirche, Innsbruck. It’s hard not to want to touch the statues in the Hofkirche (Court Church) in Innsbruck. 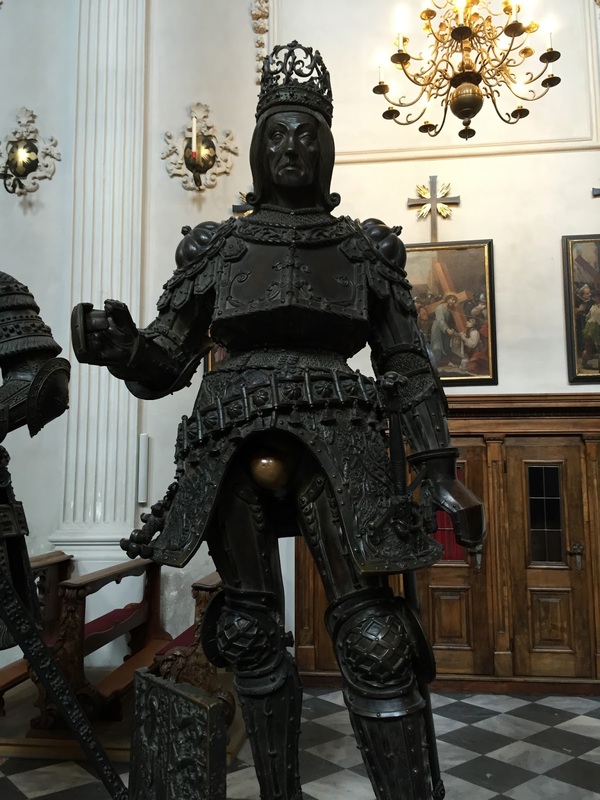 They statues depict historical figures that are bigger than life in both senses. One statue in particular, Rodolf I of Germany, has been touched quite a bit in his private area judging by how polished that part of his body is. Bergisel Ski Jump in Innsbruck. Left: Sign describing the judges' tower. Center: View of ski jump from below. Right: View of ski jump from the top. 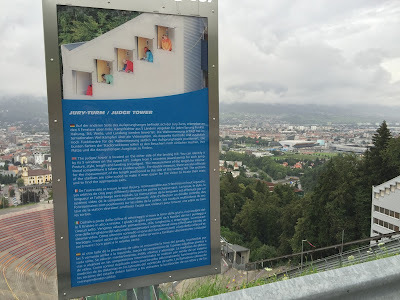 This sign was at the Bergisel Ski Jump (called trampolino in Italian). The sign describes the judge tower and the criteria on which ski jumpers are judged. 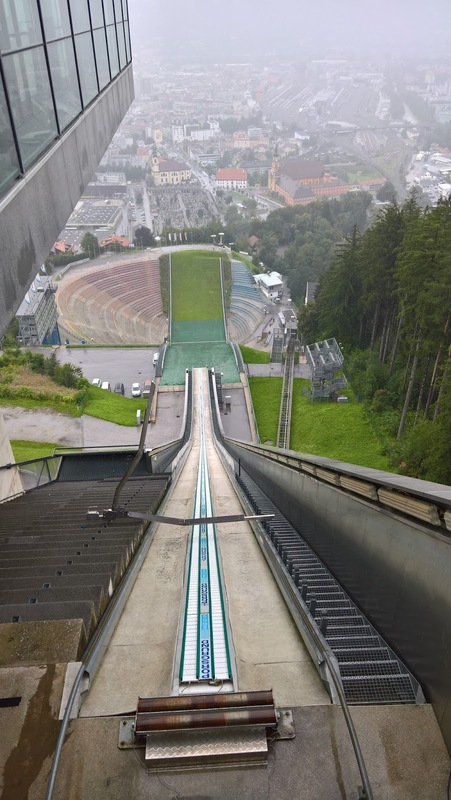 The jump is located just south of the city, an easy 45-minute walk from center and was used in the 1964 and 1976 Winter Olympics held in Innsbruck. The ramp and stylish tower that is the launch point, and today contains a restaurant and observation deck, was designed by Zaha Hadid. 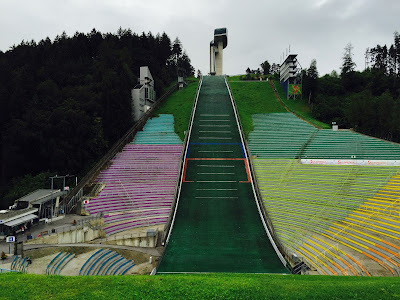 Philosophical musing: life is like a ski jump. You get judged on how you behave (posture - portamento), your style (stile), how long you live (lunghezza), and how you die (stretching it a bit, your landing or atterraggio). 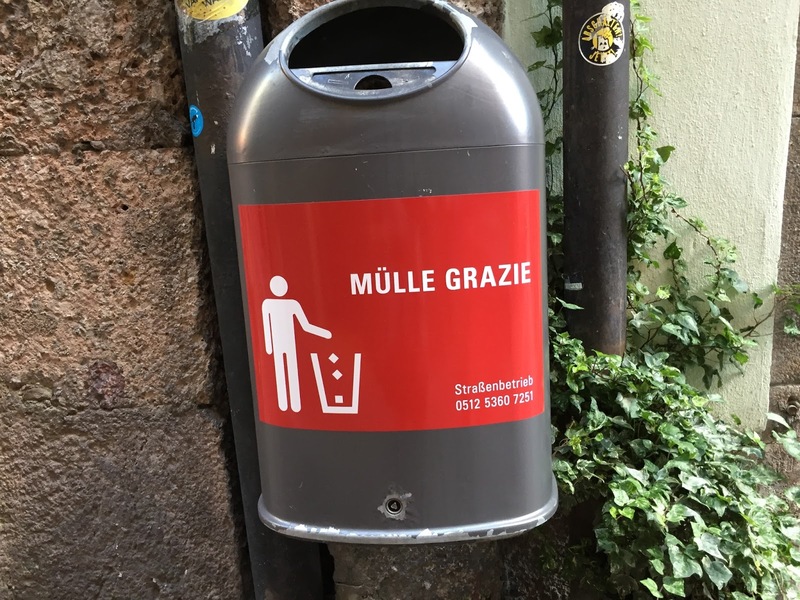 Trash can in Innsbruck with a play on Italian and German words. Mülle is trash in German. In an effort to make trash cool, catchy slogans, often a play on words, are being used in Berlin (BSR) to make people think about their trash and disposing of it. Mülle grazie is a take on mille grazie, or thank you very much. Perhaps, Innsbruck seems to have adopted a similar approach, which might explain why we saw the phrase there.